The Daily Journal has an article on Alyssa. track for the first time since the accident to see her teammates in workouts. encouraging for all of us to see her back where she put in so many miles. downs since the accident. Yesterday was a giant UP. A special thanks to you, Margaret and Doug at Dyestat for your support. athletes because of all of you. Half Moon Bay Review article. if it would be OK to share this story and I got the go-ahead so here you are. next week and I will keep you posted. 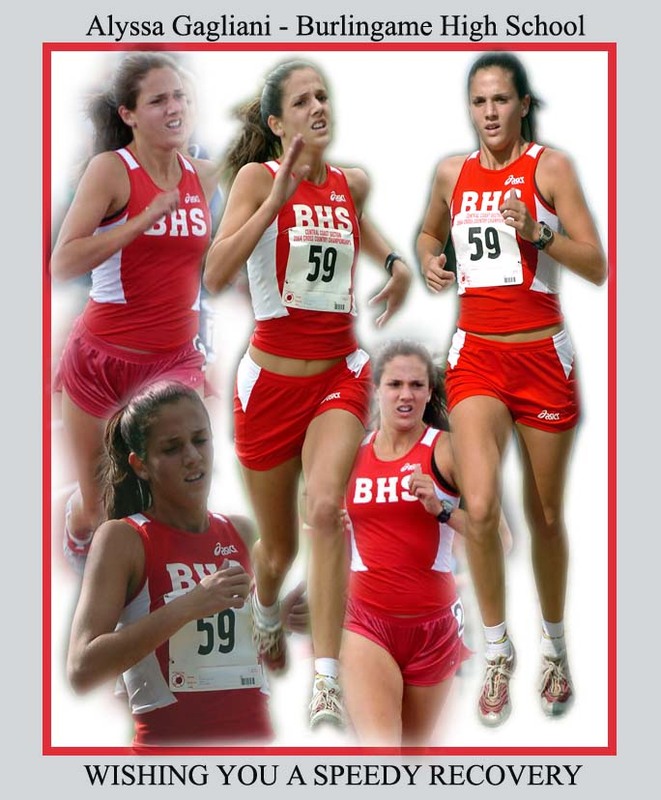 Hi Hank ...Thought I would let you know about one of our top female runners. Alyssa Gagliani, as you know, is one of Burlingame and C.C.S top performers. had an outstanding X-C year and was primed to have great year on the track. later life. Like at our age! It has been tough on her teammates as well. They have dedicated their season to her. Monte Kelleher, he finished 3rd in the high powered boys race at K-Bell, had A.G.
in her hair with A.G.. Gives the kids the sense they are after all mortal. After what happened to the Redwood Christian athlete it shows it can happen to anyone.